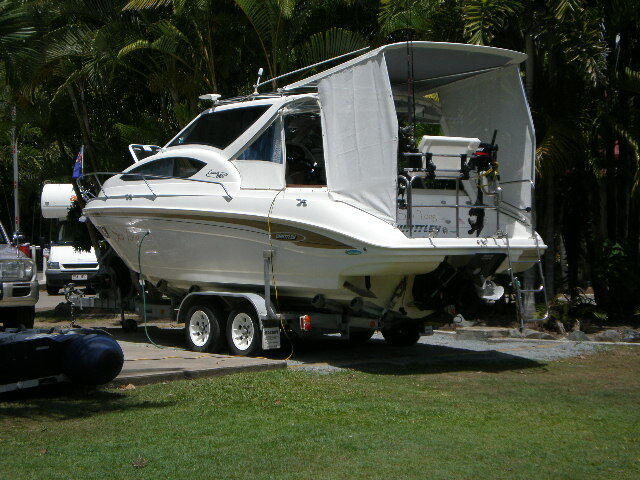 On the 9th October Occapussy pulled out of the water to return to Newcastle and KaraLynne, Athena and C Nest returned to the Airlie beach Caravan park to have a couple of days cleaning boats and preparing for their road trips. Karalynne and Athena headed south and C Nest headed off to Townsville to spend some time with their daughter. 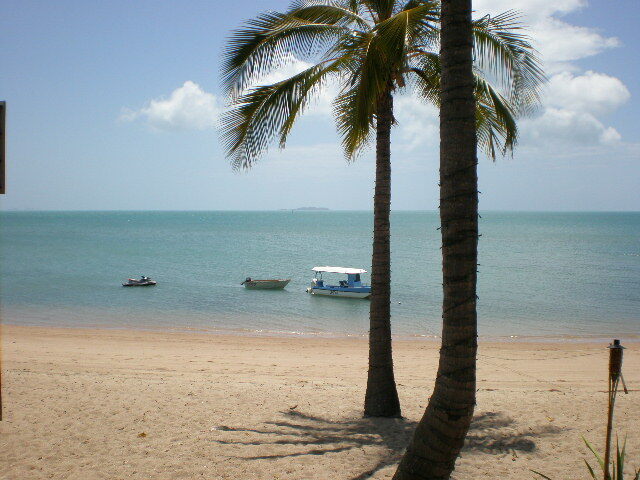 On friday the 10th, Sea Tong returned to Airlie Beach to source a new battery charger and spent the weekend in “dry dock” at the Tropical Wanderer Caravan Park (pic) whilst the new charger came up from Brisbane. 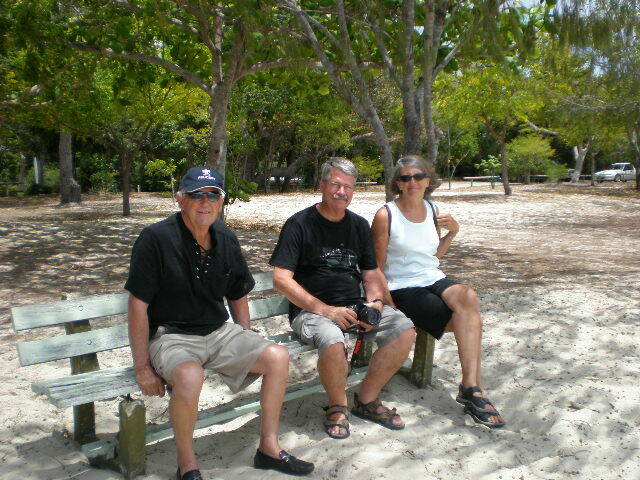 On Sunday we had a drive with Jeremy & Karen to Dingo Beach and Hydeaway Bay (pics) which are well worht a visit. 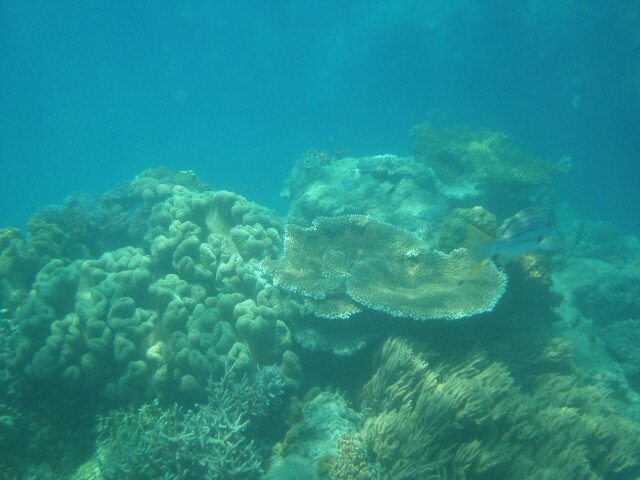 On Monday the 13th it was back in the water to spend some more time around the islands with Chattaway Two which included some excellent snorkelling at Mantaray Bay at the top of Hooke Island (pic). By thursday the weather was turning (pic) with wind speeds predicted up to 30 knots so Sea Tong and Cahttaway Two made the decision to pull out of the water and start a leisurely trip south. Thursday night was spent in Mackay in the Central Caravan Park (not recommended!). On friday Sea Tong and Chatttaway adventured to Lake Awoonga which is just west of Gladstone and only 8km off the Bruce Highway. Arriving just on dark, we spent the first night in the Lake Awoonga Caravan Park which was full of Barra fishing boats and folks. 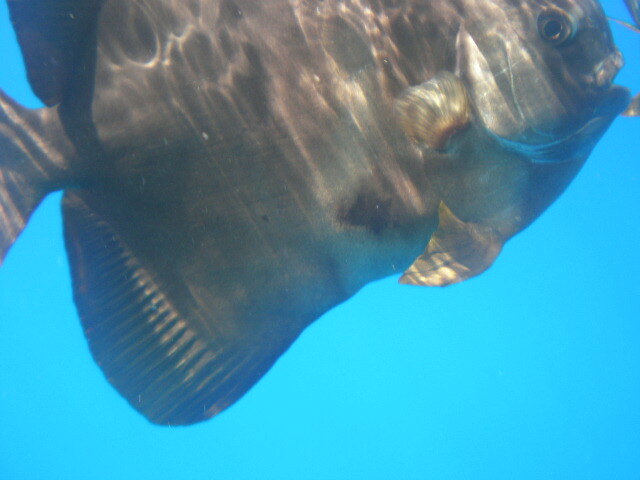 Attached is a picture of one of the barras caught by the lady in the caravan next to us! 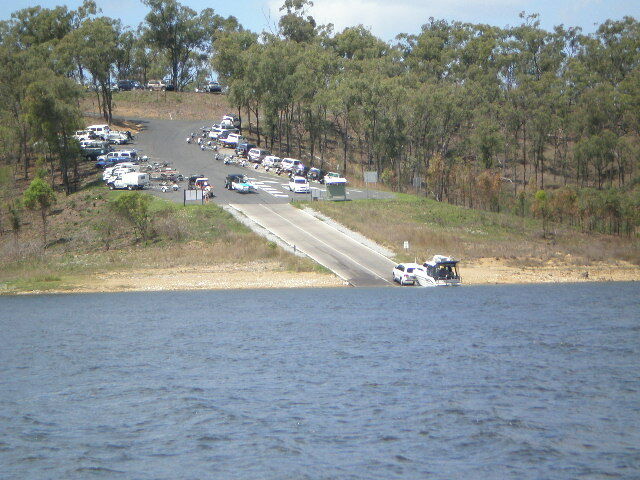 On Saturday morning Sea Tong and Chattaway Two took to the lake via the excellent nearby ramp in the Awoonga National Park (pic). 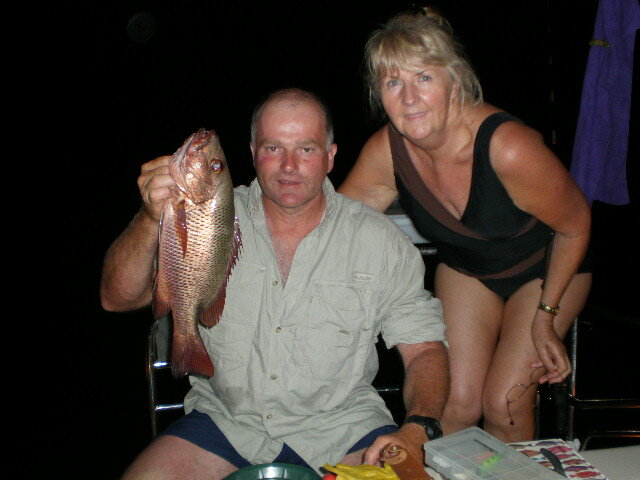 Two days and nights on the lake were very relaxing and although we didin’t land a 22kg barra (like our neighbour) we thourougly enjoyed the lake and recommend it to other club members. 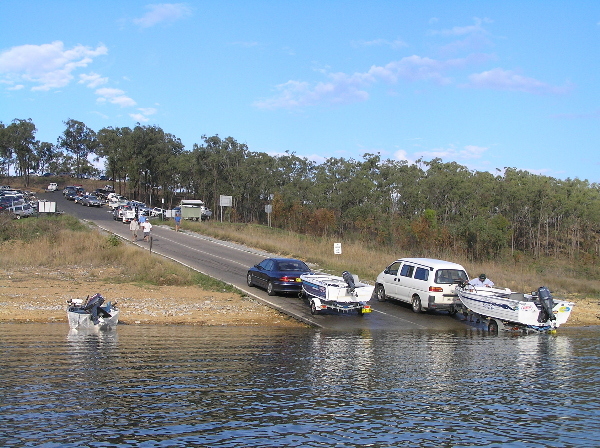 On Monday we pulled out of the Lake and headed to Maryborough for an overnight stay before Sea Tong and Chattaway Two headed in different directions to vist respective friends on the final leg south. 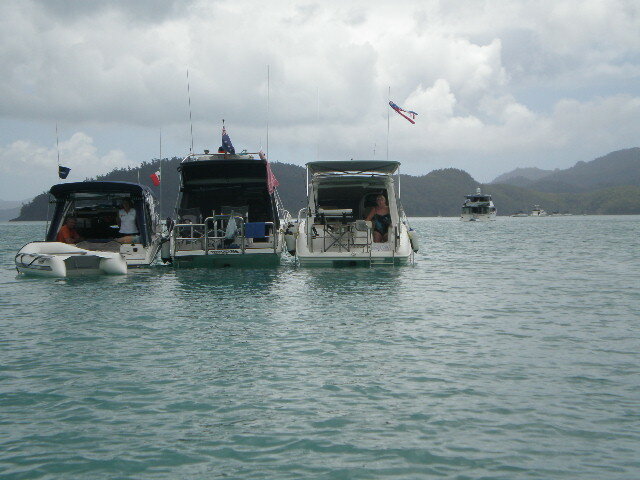 Whitsundays 2008 was a great trip enjoyed by all who attended and is certainly a trip the every club member should do at some time. 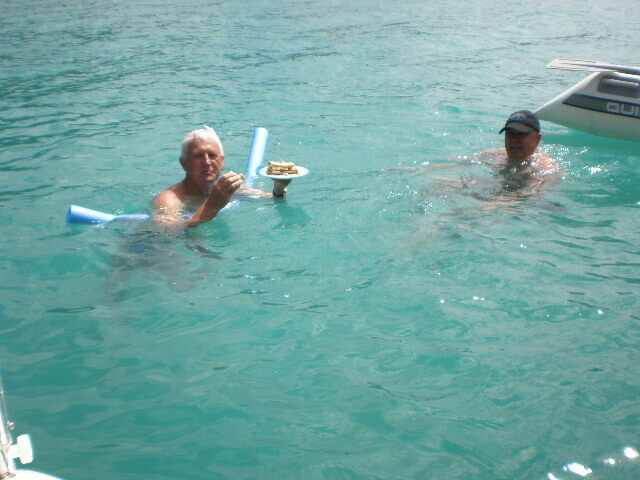 Another pic of the Hill Inlet raft-up and one of Rod and Val preparing all the fish caught by 4 of the Hill Inlet fishermen for a communal fish dinner at Chance Bay. The last pic is Pauline enjoying a delicious lunch prepared by Rod and served to her on the sundeck of Chattaway II. 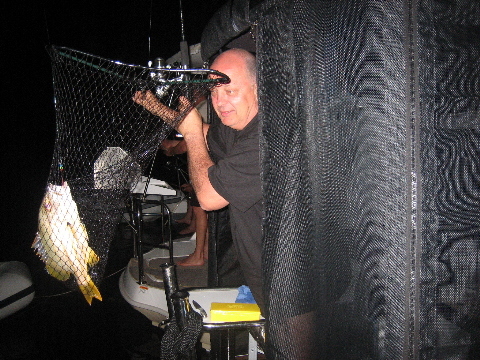 It was suggested that Rod was still “Fishing” ! 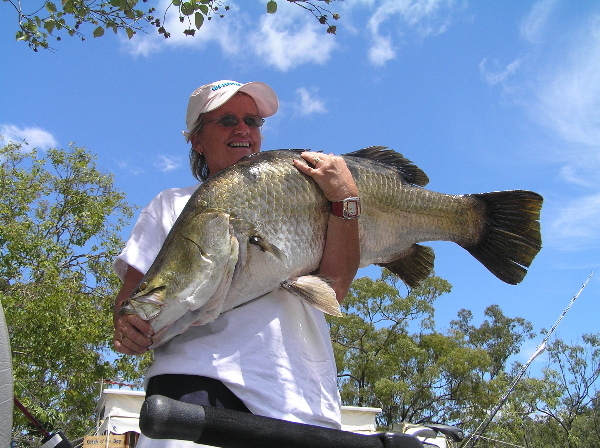 Here is the first fish ever caught by Rod! He is behaving like a new father!. 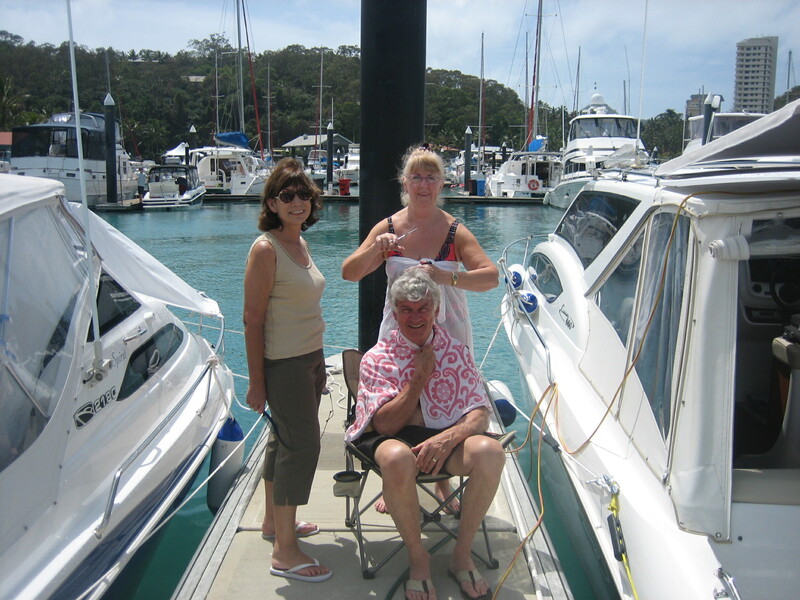 I also attach a photo of Val cutting Roger’s hair on the finger wharf at Hamilton Marina and the raft-up in Hill Inlet last night. Here are a few more pics for the web site. 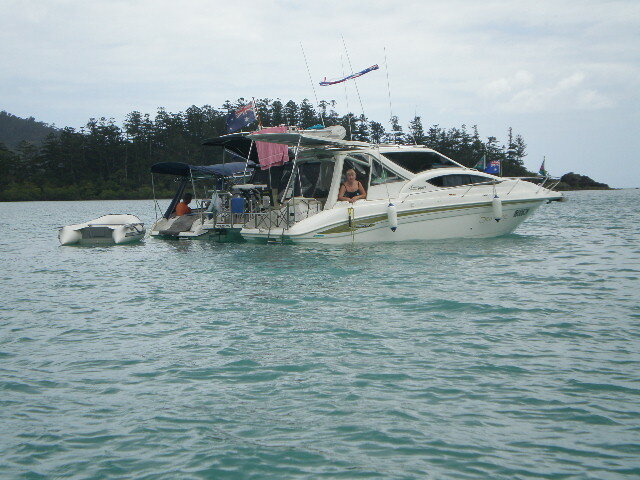 We were in Nara Inlet last night and are going to Whitehaven today for a night or so in Hill Inlet. 5 boats rendezvoused at Airlie Beach on Wednesday the 24th September and after shopping on Friday and a pleasant dinner at the nearby hotel with Peter and Ann Hewitt (who were holidaying at Airlie with friends), 3 boats – Sea Tong (Chis & Val Hall), Karalyn 2 (Jeremy & Karen Bowler) and Free Spirit (Robert Shrimpton) – put into the water to answer a distress call from Two Can Tango (John & Lyn Shearer) who had been on the water for the previous week but had suffered a mechanical failure and had been emergency towed into Tongue Bay on the north east end of Whitsunday Island. 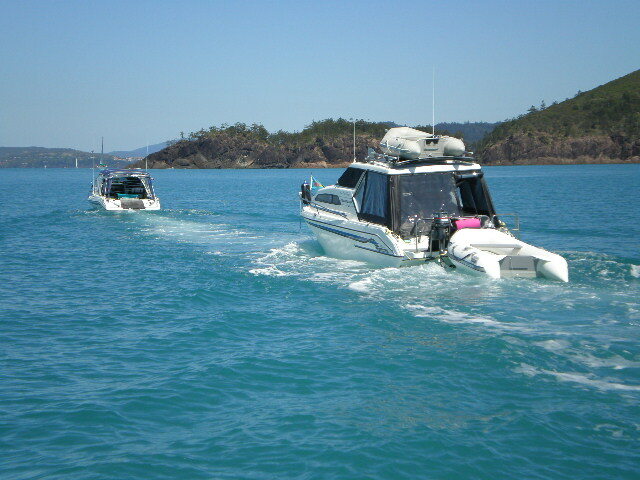 The weather was reasonable but not good enough for towing, so the 4 boats anchored in Tongue Bay for the night and then early on Saturday Karalynn2 towed the hapless Two Can Tango down the Whitehaven side of Whitsunday Island, through Solway Passage and down to Hamilton Island. Sea Tong travelled on standby with the tow, proceeding ahead through Solway to give the skipper of the “Mexican Salvage Team” a sea report before they appeared out of Solway into the Fitzallan Passage which can be rather sloppy in the wrong conditions. 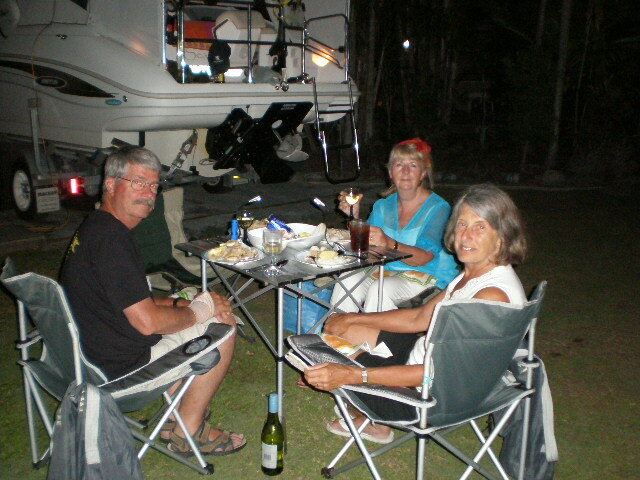 With John & Lyn safely along side at Hamilton Marina, we met up with Occapussy (John & Maree Wells) and after refuelling decided to head to Nara Inlet for the night. C-Nest (Ernie & Carol Swanson) and Atena (Roger & Athena Gregson) launched on Saturday and met up with us at Hamilton Marina where they stayed for the night. 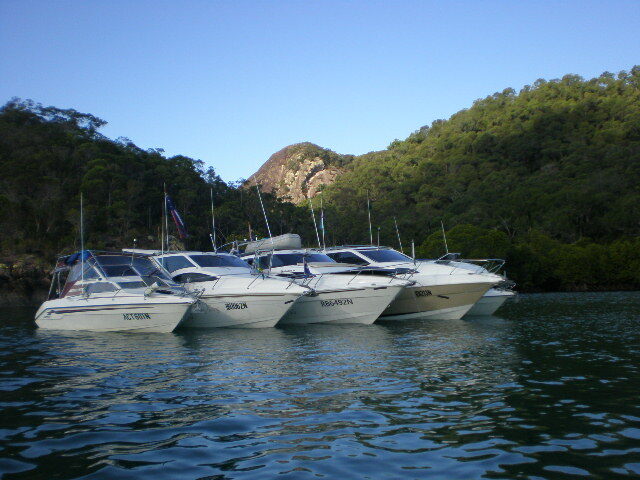 After a pleasant night at Nara we moved to Sawmill Bay (Cid Harbour) and rafted up for the night. The bay was full of turtles who are nesting at this time of the year and were all around our boats as we swam only metres away from them. On Wednesday evening the weather outlook deteriorated so we moved to Hamilton Marina for the night, which proved to be a good move as the winds rose to 25knts and seas to 8 ft on Thursday. 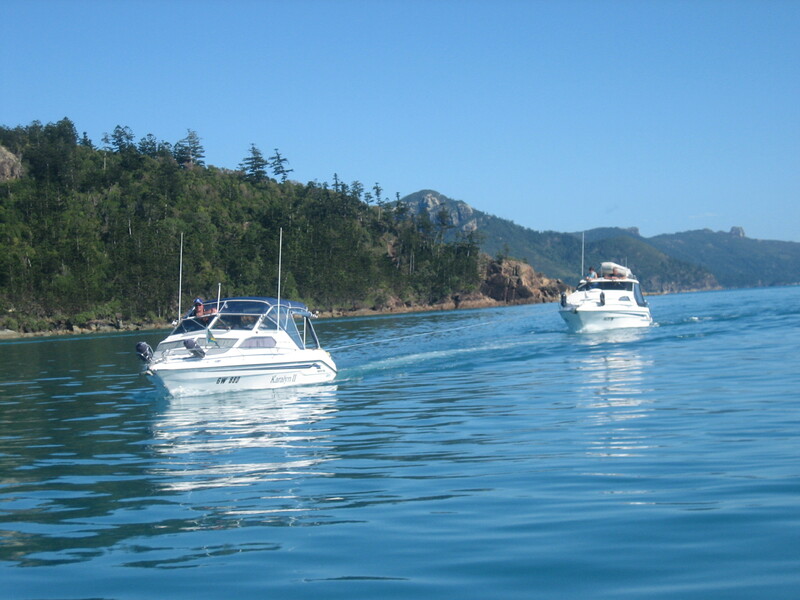 Athena and Free Spirit had been in Macona Bay on Wednesday night with C-Nest and they had a less than comfortable trip back to Hamilton Island on Thursday with Robert taking some green water over the bow whilst he still had his windscreen open! He was also unlucky enough to bump the ignition key without realising it which killed his motor whilst at full song. After a quick change of undies, the problem was solved and both Free Spirit and Athena arrived safely at Hamilton. 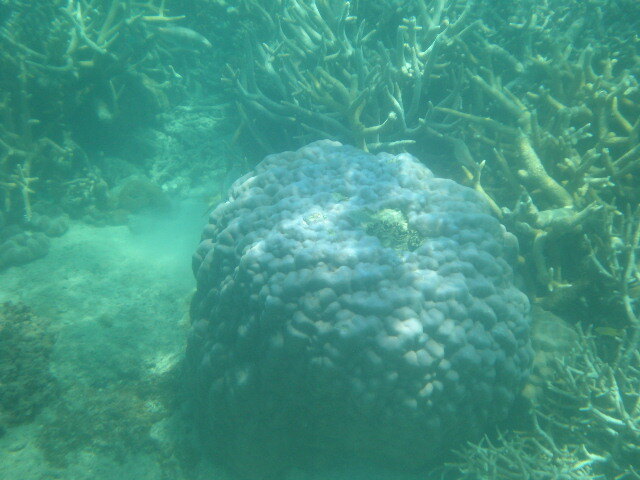 C-Nest stayed out as they were hosting their daughter on board and wanted to get some snorkelling in before returning her to Airlie Beach on Friday. President Rod in his shiny new Chattaway II arrived at Airlie Beach on Thursday and after a days shopping is expected to join other members on Friday evening or Saturday morning depending on the weather. Two Can Tango’s problem turned out to be engine overheating caused by a thermostat that had failed in the closed position. With most boats in the marina on Thursday night, we all organised a communal dinner on the marina wharf which was a great success and a very pleasant social evening. 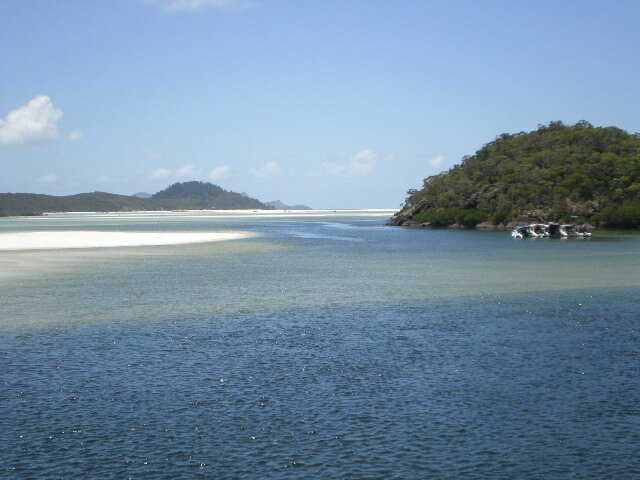 There is no doubt the Whitsundays is a very special annual event and something well worth the effort of driving up here for. Go the mighty ‘mexican Monty’!!! !